A wave of foreign real estate buying is coming into Nicaragua. Due to the effects of civil war, natural calamities and probably bad luck, it is still one of the poorest countries in Latin America. However, this is set to change, the real estate market boom of Costa Rica has spilled over to its northern neighbour. "The Costa Rica market is completely saturated," says Jaime Wheelock of the realtor Nicaragua is Hot. "Nicaragua is only 45 miles from Costa Rica. The price difference is 1,000%. You can buy the same lot here for US$300,000 that you can buy in Costa Rica for US$3 million. Foreigners can freely buy properties in Nicaragua, except for certain beach front properties. Under the Maritime Zone Law, the first 200 meters of land from high tide zone belongs to the state (but this land can usually be leaded on a 99-year lease, which is likely to be renewed). The first 50 meters are considered public terrain and cannot be developed. The next 150 meters can be developed privately through concessions from the municipal authorities. Gross rental yields on apartments in Managua are excellent, and yields on houses are good. The typical gross rental yield on an apartment in Managua - the rental return earned on the purchase price, before taxation, vacancy costs, and other costs - is around 11%. The average gross rental yield on a house is around 8%. Rental Income: Rental income earned by nonresidents is taxed at a final withholding tax of 15%. The tax base is 70% of the gross rent (consequently, only 30% of the gross rent can be deducted). 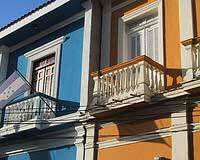 Capital Gains: A withholding tax rate of 10% is levied on capital gains realized by nonresident individuals through selling Nicaraguan real estate properties. Inheritance: Inheritances and gifts are taxed at the ordinary progressive income tax rates, from 10% to 30%. Residents: Residents are taxed on their Nicaraguan-sourced income at progressive rates, from 10% to 30%. The total round-trip transactions cost is around 8.50% to 17% inclusive of the hefty real estate agent fee that goes from 5% to 10%. The total cost of registering property is about 3.50% to 7% of the property value. The nine procedures needed are completed in about 54 days. However, the lack of clear title on some properties, both urban and rural, is a major consideration for investors. Nicaragua’s rental market legislation is generally pro-landlord, being very supportive of what the parties have agreed in the written contract. Rent: Rents and rental increases can be freely agreed by the parties involved. Tenant Eviction: A problem though is the litigation process for tenant eviction, it can take years with no guaranteed favorable results. Nicaragua (pop. 5.7 million, GDP/cap US$939) is still struggling to overcome the consequences of dictatorship, civil war and natural calamities. Daniel Ortega won a second term as president in Nicaragua’s November 2006 elections. He had led the Sandinista movement during the revolution against the Somoza dictatorship (1937-1979) and took power in 1980 as head of the leftist Sandinista government. His rule was confirmed by his election in 1984, but his country continued to be devastated by the US-sponsored right-wing Contra rebel attacks, which only ended when the Sandinistas negotiated a peace agreement and held fresh elections in 1990, which the right won. In November 2006 Ortega was returned to power after 14 years of centre-right rule, which saw the forgiveness of 80% of Nicaragua’s debt, a free trade deal with the US, and a large degree of economic openness achieved due to a government focus on liberalization and privatization. Ortega has emphasized that he will continue the free-market course, but his election has muted investment interest in Nicaragua. Peace has brought some economic growth, lower inflation, and lower unemployment. GDP growth has however been somewhat subdued at 3.6% in 2007 and 3.7% in 2006. The inflation rate was a high 8.2% in 2007, but down from 3,000% in 1990 and 13,109% in 1987. But improvements are still badly needed. Real GDP per capita in 2007 is still 29% lower than its 1981 level. About 40% of the population is still below poverty line. Inequality is still high and concerns of the indigenous population are not adequately addressed.